Zelda D'Aprano was born in 1928 in the Melbourne inner-city suburb of Carlton. When she left school and began working in factories to help support her family, she became aware of the inequalities that existed between the classes – and between the sexes. 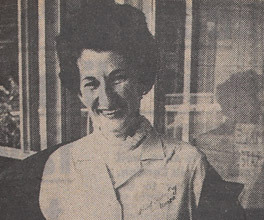 After Zelda's marriage ended, when she was 37, she began working at the Meat Industry Union, where she found a lot of female workers were dissatisfied with the inequalities that they faced in the workplace. At the time, the meat industry was being used as a test case for the Equal Pay campaign, and Zelda's employer – a fellow communist – asked her to distribute pamphlets around the city in support of the campaign. I just couldn't believe this, and I thought, here are all the women, here we are, all sitting here as if we haven't got a brain in our bloody heads, as if we're incapable of speaking for ourselves on how much we think we're worth. And here are all these men arguing about how much we're worth and all men are going to make the decision. State Library fo Victoria interview with Zelda D'Aprano, July 2007. ... I thought about it and I thought, well something's got to happen. Someone's got to do something ... [and] I was prepared to chain myself up. Around the time of D'Aprano's protest, women only received about 75 percent of a man's salary, for exactly the same job. So, on 21 October 1969, Zelda chained herself to the Commonwealth Building in Spring Street, Melbourne, until she was cut free by the Commonwealth Police. The event drew enormous attention to the Equal Pay campaign, and led to Zelda co-establishing the Women's Action Committee, which campaigned on issues like equal pay for women, and other forms of sexual discrimination. In 1972 the Commonwealth Conciliation and Arbitration Commission finally extended the equal pay concept to 'equal pay for work of equal value', and subsequent revisions have made sure that women in Victoria retain this hard-won right. They may have both been called 'Eliza', but Batman and Fawkner's wives were very different women. World War II was an opportunity for Australian women to take a step outside of the domestic sphere.